The United Nations is seeking to hold a conference in l.ibya in the coming weeks to agree on a national agenda to rebuild the fractured country and spell out the path to elections, the U.N. envoy said Friday. “We are working night and day to pull together these various elements to ensure the most productive event,” he said. Salame cited some progress in Libya in recent months to stabilize the country and improve living conditions including a September cease-fire which has generally brought calm to the capital, Tripoli, but has been broken including on Dec. 25 with an attack by Islamic State extremists on the Ministry of Foreign Affairs and two days ago with renewed clashes. 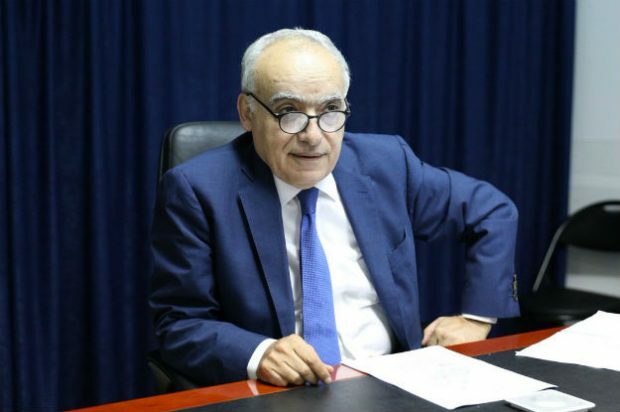 On another positive note, U.N. envoy said the economy has continued to stabilize, and the black-market price of the Libyan Dinar against the U.S. dollar “has collapsed” as a result of measures announced last September. Salame said he heard first-hand about “the wanton brutality” of Islamic State militants, foreign mercenaries and criminals who prey on citizens and migrants during a trip a few days ago to southern Libya, the first by a U.N. envoy since 2012. Salame said oil production had topped one million barrels a day, “driving much needed revenue into the treasury,” but disturbances at southern oil fields over the lack of services in the region have recently reduced production. Calling recent gains “fragile and reversible,” he stressed that “concerted national leadership” is key to uniting the country and improving the economy. “Without the concerted support of the international community, spoilers will sabotage the political process and undo any progress made,” he said.